Motorcycles are the most hazardous form of motor vehicle transportation. In 2017, 5,172 motorcyclists were killed. Additionally, 88,000 were injured on our nation’s roads in 2015, the most recent year injury data is available. NHTSA estimates that helmets saved the lives of 1,870 motorcyclists in 2017 and that 750 more lives in all states could have been saved if all motorcyclists had worn helmets. The number of motorcycle crash fatalities has more than doubled since a low of 2,116 motorcycle crash deaths in 1997. All-rider helmet laws increase motorcycle helmet use, decrease deaths and injuries, and save taxpayer dollars. There were 10 times as many unhelmeted motorcyclist fatalities in states without universal helmet laws (1,777 unhelmeted fatalities) as in states with universal helmet laws (170 unhelmeted fatalities) in 2017. Annually, motorcycle crashes cost $12.9 billion in economic impacts and $66 billion in societal harm as measured by comprehensive costs based on 2010 data. Compared to other motor vehicle crashes, these costs are disproportionately caused by fatalities and serious injuries. Motorcycle helmets are currently preventing $17 billion in societal harm annually, but another $8 billion in harm could be prevented if all motorcyclists wore helmets. Per vehicle mile traveled, motorcyclists were nearly 28 times more frequently killed in a traffic crash than occupants of passenger cars in traffic crashes. In Michigan, which repealed its all-rider law in 2012, there would have been 26 fewer motorcycle crash deaths (a 21 percent reduction) if the helmet mandate was still in place, according to the University of Michigan Transportation Research Institute. Additionally, in the remainder of the year after the helmet repeal was enacted (April of 2012), only 74 percent of motorcyclists involved in crashes were helmeted, compared to 98 percent in the same time period of the previous four years. A study of motorcyclist crash injuries before and after Michigan partially repealed its motorcycle helmet-use law found that following the repeal, the percentage of hospitalized trauma patients with a head injury rose 14 and the percentage of skull fracture-related injuries rose 38 percent. The study also found that trauma patients with head injuries were more likely to need costly hospital services, such as intensive-care unit stays, ventilation, and neurosurgical interventions than patients without head injuries. A study of motorcycle crash victims in Wisconsin from 2010-2015 by researchers at the University of Wisconsin in Madison found that unhelmeted riders in the state sustained cervical spine injuries twice as often as riders who wore helmets. In states with an all-rider helmet law, use of a helmet resulted in economic costs saved to society of $725 per registered motorcycle, compared with $198 per registered motorcycle in states without such a law. Helmets are currently saving $2.7 billion in economic costs annually. In 2017, the most recent year full data is available, motorcyclists represented 14 percent of the total traffic fatalities, despite representing on average only three percent of all registered vehicles. By an overwhelming majority (more than 82 percent), Americans favor state laws requiring all motorcyclists to wear helmets. Motorcycle helmets reduce the risk of head injury by 69 percent and reduce the risk of death by 42 percent. 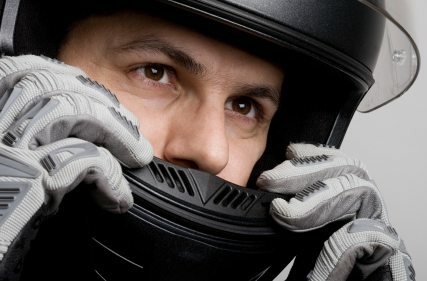 When crashes occur, motorcyclists need adequate head protection to prevent one of the leading causes of death and disability in America — head injuries.